Winter is coming. You know it. Well, it depends on your personal situation. To help you out find the perfect unit right now, I've put together a comprehensive comparison (with reviews!) of the top units on the market. There's also a Top 3 section for each kind of heater out there. What you should know before buying a unit. If you’re looking for an industrial-strength garage heater that can be used with either natural gas or propane, then you will love the Hot Dawg from Modine. First of all, this is a highly reputable company, meaning that you can trust that you’re getting the best parts and materials. Secondly, you will be impressed by how well it can heat your garage. What I like most about the Hot Dawg is it’s quiet and efficient performance. It can operate all day long, and it will never get irritating, and it won’t waste a lot of energy. In fact, this model is 80% efficient when producing heat, which is remarkable when you compare it to other natural gas heaters. The other thing that I appreciate is the installation process. Unless you are really inexperienced at installing these kinds of things, you should be able to do it yourself without much trouble. I would suggest hiring a pro to inspect the unit afterward to ensure that you didn’t mess anything up, but that will still be a lot cheaper than hiring someone to hook it up for you. The only downside to the Hot Dawg is that it’s almost too strong. As such, the price tag is higher than most commercial or residential models, and it won’t work unless you have sufficient space. While you can connect it to a thermostat to help regulate the temperature, it’s better when you have more room for it to work. Otherwise, things will heat up super fast. Next, we have a directional heater that uses a high-powered blower to distribute the heat evenly. This model is perfect if you need to keep a particular area hotter than others, or if you want a portable model that is also super powerful. What I like about this heater is that it works quickly. You can feel the effects after just a few minutes, thanks to the directional system. Surprisingly, it works on an area of up to 1,350 square feet. I was worried that it wouldn’t spread the heat that well, but it does so much better than I expected. The downside of this heater is that it’s loud. The blower is much more intense than most heaters, so you will have to get used to it. Also, it can be a safety hazard if you don’t keep it out of the way, as the surface can get quite hot after a while. Thankfully, it does have some built-in safety features. First, if it gets knocked over, then it will shut off automatically. Also, if it overheats, it will turn off so that it can cool down. I also appreciate that it comes with an adjustable stand so that you can have some variety in how you position it. 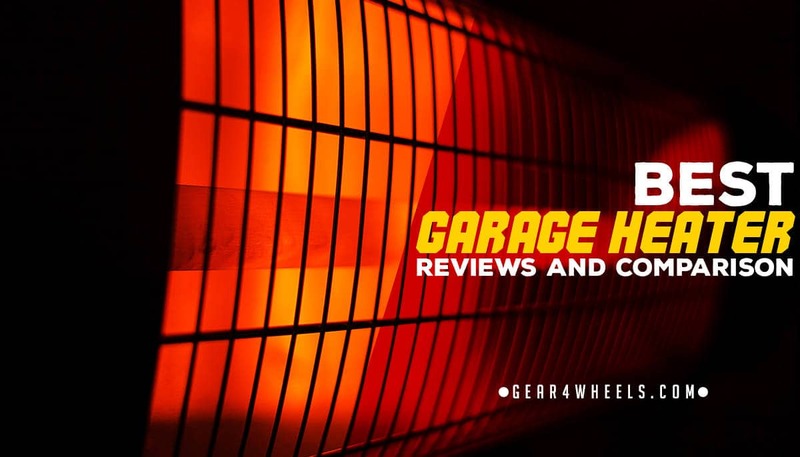 The Fahrenheat Industrial Electric delivers consistent heat to the garage or anywhere else you might find yourself needing a little extra warmth. Instead of taking up precious floor space with your unit, simply attach this Fahrenheat unit to the ceiling via the included mounting bracket and open up your floor space once again. 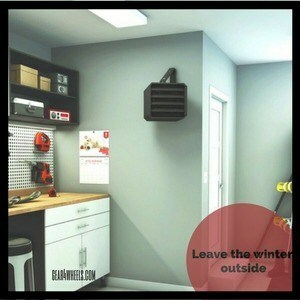 This heater works best when mounted in a corner to provide even hearing to your entire area. By using the adjustable downdraft on the front of the heater, you can point the warm air anywhere that you’d like it to go. Whether you want direct heat over one section of your garage or need even heat throughout, you can customize your heating to get the temperature comfort that you need. This heater warms up to 400 square feet, which gives you plenty of space to putter around without leaving the heating zone. With a powerful combination of radiant and convection heating, the portable Big Buddy gives you the best warming option for your space. You can adjust the heat levels with an intuitive settings control to meet the temperature needs of even the bitterest winter days. The Big Buddy has a diminute size that makes it a cinch to tote around your workspace or from place to place. With an integrated easy-carry handle and cord bays for external components, this unit is self-contained and simple to maneuver. Safety features built right in. In an effort to protect you and your property, the Big Buddy has integrated safety features that keep it from causing and fire or gas related problems. An automatic low oxygen shutoff monitors the air and turns the machine off when oxygen levels are too low. And an accidental tip-over safety shut off powers the device down if it’s tipped or knocked over. For those of you who don’t need a massive heater like the Hot Dawg, you may prefer a more subdued model like this one from Cadet. Dubbed “The Hot One,” this machine is perfect for most small spaces. It works well as an area heater, and it can sufficiently warm a garage up to 600 feet. The portability and control panel for this heater is its best qualities. It comes with a thermostat dial so that you can adjust the temperature between 40-85 degrees. It will also wait until the unit is sufficiently heated before activating the fan, which is a nice touch. It has three modes: on, off, and auto, which makes it even more suitable for area heating. What I don’t like about the Hot One is that it doesn’t come with a carrying handle. So, if you have to move it while it’s on, you will need to put on oven mitts or something as the shell can get scalding after a while. Also, if it overheats, you need to reset it manually by triggering the button on the side. The only way to do this is with something small and pointy, so be prepared to try sticking a sharp pencil or something into it. Just wait until it’s cooled off a bit before you do anything. Overall, this heater is excellent for most small, one-car garages, and it will be a good addition to places that don’t need a ton of heat on a regular basis. Also, you will need a 20-amp outlet, so be sure to check your electrical capabilities before turning this thing on. Since it uses 5000 watts, it can blow your breaker really easily. Obviously one of the most important considerations for choosing your garage heater is what type of heater you want in your space. Do you have a large space that needs consistent heating each day? Or are you working in a smaller garage and only a few hours each weekend? Thinking through these questions will guide your decision process to help you settle on a heater to suit your needs. Whether you plan to use it often or infrequently, as well as your unique garage setup, will dramatically impact your heater choice. A forced air heater works by blasting hot air into a space to provide warmth inside. This type of heater can be powered by electricity or gas, depending on your heater type and home setup. Gas units are cheaper to operate than electric ones are, though electric units are generally a little easier to install. Additionally, you often need to check for local guidelines and have a professional install your gas unit to keep things on the legal side. Pros of forced air heat. Cons of forced air heat. Radiant heaters use strong reflectors harness infrared heat and direct it outward and into your garage. These heaters provide steady warmth and are best mounted out of the way to keep from accidentally bumping into them. Convection heating works similarly to the average oven - by utilizing a hidden heating element or small flame to warm air inside of the unit, which rises naturally and escapes the unit to warm the room. Convection units are typically cheaper and portable, though higher end mounted models are available. Do you want to have the freedom to move your heater or have it stationary in one location? Your mobility choice will influence whether you can keep your heater in a single spot or take it with you from workstation to workstation. Mounted units attach to the garage ceiling or wall and offer consistent heat from one location. Often, they have adjustable temperature settings and down events to give you heat where you need it most. Portable heaters offer exactly what you think they might - portability. Generally, these electric units plug right into the wall of your workspace and can be transported from location to location.Gas powered portable heaters do exist, though they often aren’t rated for use indoors - obviously, the above-mentioned Dyna-Glo RMC-FA40DGD is an exception to that rule. The type of power that you choose depends both on personal preference and your home fuel setup. Most propane units are tied directly into your home’s gas line, to utilize the gas power you already have there. Some portable units can be powered with small, portable propane tanks, but typically this is a cost-ineffective way to fuel them. Natural gas powered heaters also tap right into your home’s natural gas line to draw their energy. Over time, these units are cost effective, since they utilize a small amount of a utility that you already pay for. Obviously with such a potentially dangerous device as a garage heater, safety must be a top concern. 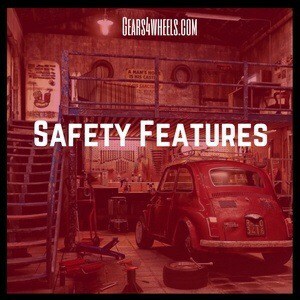 When choosing a garage heater, consider the safety features that each unit has to offer. If the heater is accidentally tipped or otherwise falls over, the tip-over switch shuts off the unit immediately. This keeps heating elements from accidentally contacting material that they should not or any broken components from causing improper function of the heater itself. Cool touch is just as it sounds - a heater that is cool to touch. Instead of having exposed heating elements or a body that runs super hot during operation, a cool touch heater can be brushed against or run into without causing burns or other injury. Does your home have propane or natural gas? How often do you use your workspace? Is physical square footage an issue? How cold are your winters? Electric heaters are safe if they count with tip over switch, overhead protection and cooltouch, but as "risky" as any other electricalpiece of equipment. You must follow the traditional safety measures you would do for any other such item. Propane garage heaters are safe if they are designed for indoors and count with an exhaust line properly installed. You should not use an outdoors propane heater inside your garage. How big a garage heater do I need? Majority of manufacturers will give you a good estimate of how many sq feet is the garage heater able to heat properly. You need to know how big is your garage first. For the average 2-car garage, 5000w or 60k BTU should do. How do I install a garage heater vent? Check this fantastic video to see a complete step-by-step installation of a gas heater. When comparing all of these heaters, I have to say that my top pick is the Hot Dawg from Modine. I love the fact that it’s got industrial-strength performance and that it’s easy to install (relatively speaking). Plus, it’s quieter and more efficient than the competition. Overall, the Hot Dawg is more powerful and more reliable than almost anything else we’ve seen.